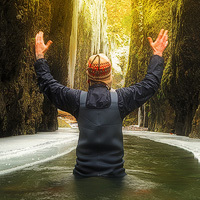 We want to thank TJ Thorne, this month's spotlighted ApertureAcademy.com guest photographer, for generously sharing his time, photography and thoughts with all of us! Please visit his links to see more of his stunning work, and to let him know you enjoyed this interview! I have had an interest for as far back as I can remember but I got my first "real" camera for a project that I was working on for school. It was a 35mm 'point and shoot', and I spent a whopping $150 on it. I thought it was awesome. After the project I used it to take photos at punk rock shows, of food that I had cooked (I'm in the culinary profession), and of my friends and I snowboarding. As time went on my interest grew, and I upgraded to different 35mm cameras, and my subject matter changed. But I never spent the time to really LEARN how to use the camera or what was happening inside. Fast forward fifteen years, at which point I was living in the Pacific Northwest. I was an avid hiker and always took my camera with me. The more hikes that I went on, the more that they became about photographic opportunity rather than elevation gain and mileage. As soon as I created what I consider to be my first official landscape image, I decided to throw myself into the genre and try to learn as much as I could. The following year I was out in the field every minute that I could be, and I really learned a ton and came a long way with my progression. :: What was the best piece of advice you received while getting started? When I first started out it was, 'Never forget WHY you shoot.' And honestly I think that would be hard for me, but I do have to think about it sometimes when I'm trying to decide whether or not to include an image in my portfolio. But lately the piece of advice that's my favorite is a twist on the Weegee Fellig adage, 'f/8 and be there.' My friend Jeff Swanson liked to say, 'f/it and be there.' He passed away in August due to complications from melanoma. He was only 30 years old... so that saying hits even harder now. Stop worrying about the conditions…the possibilities…and just go live life. Even if I don't get what I want, I'll still be out in nature breathing, feeling, and living. That's why I shoot. :: What brought you to the Pacific NW from Pennsylvania? Snowboarding. It's all I cared about as an extracurricular activity while growing up. Mt. Hood was a paradise that I had seen in magazines and videos and I could snowboard YEAR ROUND! I had never been west of Kentucky before moving here. In 2001 I packed up anything that was important to me and moved to Portland, a city I had never been to, a city where I didn't know anyone, and where I had no job. And it never felt wrong, overwhelming, or scary. I'm extremely grateful to live here. The photographic diversity within even a day's drive is astounding. I doubt that I would be where I am with photography if I didn't live in one of the most beautiful places in the world. :: I've noticed you're taking along your kid with you on a couple shoots, how has that changed the photography approach? That's my son Elliott and he's six years old. As with most six-year-olds, I get a fair amount of huffing and puffing about long drives and waiting around for sunset. When he's with me we're usually on a trip that has the primary purpose of just getting out of the city, so I don't base my destination on conditions. I do tend to hijack the itinerary as it gets closer to sunset, but I try to remain in the mindset that it's a "family first" trip, and I keep the destinations 'safe'. He's been with me for several images in my portfolio and he brings his own Fisher-Price camera along. Or rather.. I bring it. Ha! He uses it sometimes, and when I've looked at the photos, I've been surprised with the intent that is behind some of them. Zooming in to take a photo of the mountain, or more macro type shots of flowers and bugs. I'm sure most kids would take photos of those things but I can't help be proud. As he's getting older I'll be taking him out more and for longer hikes. He's extremely well behaved and listens. We have a lot of trust and respect for each other so he stays put while I stand in a creek because he knows that I want him over there to keep safe. He did really well at Proxy Falls and Crater Lake a couple of weekends ago. We even hiked up some steeper/loose off-trail stuff and once I was done shooting the creek we crossed it together and I took him to where I was standing. My main hope is that, while he may be frustrated and 'bored' now, he'll look back on these moments with appreciation, gratitude, and a desire for more. And hopefully he will continue to have a growing interest in photography, but I won't force it on him. Hmm. I'm going to have to say my Goorin Brothers hat. I hang it off the front of my lens as I clean off waterfall mist and to keep it clean until there's a lull in spray so that I can expose. The shape of the hat allows me to clean my lens INSIDE something rather than behind something. And when spray is bad it really helps make it easier. :: What is the scariest thing that has ever happened to you while on a shoot, and has it changed the way you work when in the field? While exploring at Cape Kiwanda I fell into a dangerous spot of the ocean in an instinctual attempt to save my girlfriend. She had taken a wrong step and was sliding down a seaweed covered slope towards the water. I'm always very careful when I'm out and rarely put myself into a situation where I don't feel comfortable or confident. I had been standing on a flat area and even testing my footing on the slope but it was too slippery for me. I turned and walked away. I'll never forget the feeling I got when I heard her yell my name, and I turned around to see her sliding on her side backwards towards the churning water. I still have flashbacks to that feeling and the look on her face to this day. She's not a strong swimmer, and my instinct kicked in. I yelled 'NO!!' but was about 5 steps away from her. I didn't even think about it. 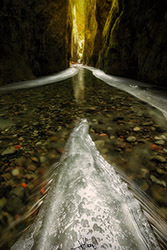 I ran over and stepped onto the slope while reaching for her, but my momentum sent me sliding as well, and I slid feet-first off a ten-foot drop into the water with all of my gear on my back. The way that it has changed how I work in the field is that I have a lot more respect for the environment around me, and I realize that a lot of the risks are uncontrollable. I'm now a lot more aware of the situations that I might be putting people in. I, myself, might be comfortable but I need to make sure that the ones around me are being safe as well. It was a huge lesson. 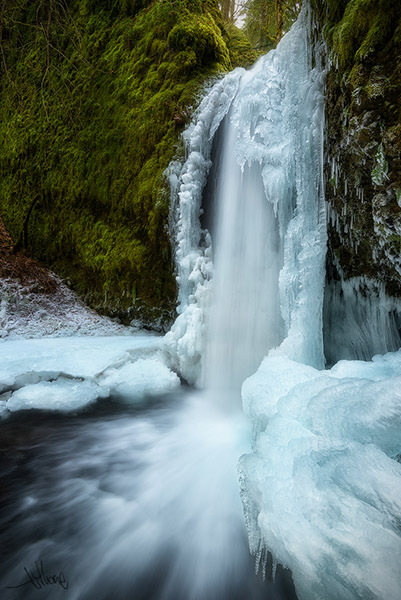 :: During a stretch of freezing temperatures last year you ventured into some of the waterfalls and gorges in Oregon to do some photography. What challenges did you face and how did you adapt to make some of these images? That was one of my favorite weeks. :-) We had a couple instances of freezing temperatures and snow this past winter, which rarely happens, especially to the extent that it did. A week's worth of freezing temperatures and there was no precipitation to make the roads nasty. The gorge was a zoo of photographers. All of the easily accessible falls were being shot to death, so I decided to hit some other locations that might not have been getting considered. My first goal was Oneonta Gorge. I had visions of epic icicles hanging from the walls. 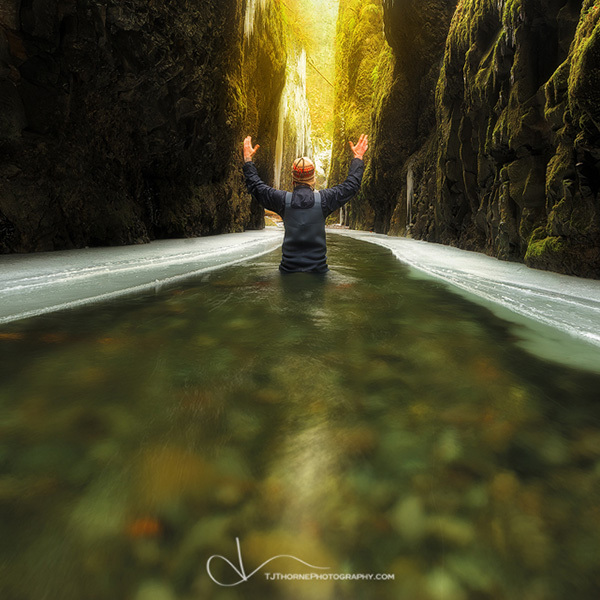 I went into the gorge three times during a matter of days and didn't get those conditions. The last time I went in was the very last day we were going to have freezing temperatures. The creek had finally started to freeze over and ice was building along the sides. I was able to get a shot I liked there. Another interest was Mossy Grotto. 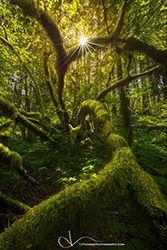 It's an extremely popular location in the spring because of its verdant qualities. I made the solo hike there and spent about 4 hours at the location trying to capture every detail of numerous compositions. It was telling to see how much of a role the creek plays in the more wide compositions of the location. Without it, there was no impact. Also without the ferns and spring growth, it just wasn't that photogenic. I found my favorite and most impactful shots were from up close. But that meant intense freezing spray. I bracketed all of my compositions for both focus and exposure (I wasn't going to mess up these rare conditions!) so that meant scraping ice off of my lens, waiting for a lull in the spray, exposing, and then doing it all again repeatedly. It was a lot of effort, but I was very strategic and meticulous, and I feel like it paid off. :: If you had to go out for one week and shoot with only a 256MB memory card and one lens, which lens would you take and how would you handle that limited memory card? I'd probably take the Nikkor 24-70 f/2.8. I love that lens. I don't want to limit myself to super wide or a telephoto, so I'd take the mid-range. I could always stitch for something wider, and with 24.3 megapixels I'd have some wiggle room on cropping as well. As far as dealing with the limited memory... I guess it depends on what I'm doing. Ideally I'd be able to spend a couple of days studying the way light is playing off my my subject and save my limited exposures for the best light. My compositions would be hyperfocal-based instead of my typical focus-stacked style. With having the dynamic range of the D610, I wouldn't have to worry so much about about exposure blending, so that would help me as well. But generally, I think I would just go for it and hit the shutter when it felt right. As much as I love getting a photo, the real reason I'm out is to be in touch with nature and to live uninhibited…if only for a couple of hours. :: How have you seen your work grow in the past three years? Has social media and that avenue helped that process? Where do I start!? Ha! I've been exploring the landscape genre and improving my knowledge of capture techniques for most of that time. I've also gone from using Lightroom only to beginning to use luminosity masking and more advanced techniques. In late 2013 I put up 26 images in a gallery show so I had to learn about printing and sharpening and that end of processing. I feel like my progression has been very fast. The majority of my work was made in 2013, and I'm pretty proud of that work. I'll tell you…I wouldn't be where I am without social media. That platform has made the connections I have possible, and some of those people have turned into great friends and mentors. I learn a ton from Alex Noriega and Ted Gore, two of my best photographer friends. Our friendships grew over social media and it's our main form of contact. We talk every single day and rarely text each other's phones! My critique group is small, intimate (51 people), and full of some of the best landscape photographers from around the world, in my opinion. That group is social media based and has really helped my progression in post-processing, my artistic vision, and how to SEE a photo. So in three years I've fallen into a genre that speaks to me at a profound level, and I've learned the skills necessary to take my work to the next level both in the field and in the digital darkroom. :: What are your goals with your work for the next year? Any trips or projects planned? I want to diversify my portfolio. I am pretty chained to the Pacific Northwest, and I have a strong urge to visit the Southwest, to shoot more mountains, and just basically to try to get out and live more. I'd say diversification is my first goal. As far as trips and projects go? I will be spending two weeks in Crater Lake National Park as an Artist-in-Residence. I feel very lucky to have received the appointment as only four people per year are selected. Never in my life have I spent that much time in one place of nature, let alone unattached from schedules, bills, and everything else in life. And…I'll have my camera with me. While I'll be supplied housing through the National Park Service, I plan to live out of my tent as much as possible and just get to the nuts and bolts of life. Just me, nature, and my camera. I'm curious to see how and if it will change my photography. Right now it's a form of escape for me. But what will happen when I'm already escaped? I can't wait to see, and October can't come soon enough. :: What inspires you to go out and shoot these days, and what would make you want to hang up your gear forever? Nature is my meditation. It's where I connect with my true self and shed my stress. It's where I center myself. So I need to get out regardless. Maybe I'm too new to have the frustrations needed to make me want to hang up my gear. I've never thought about wanting to do that. The only thing getting deeper and deeper into photography does is make me want to hang up the gear of other things in my life: working for other people, clocking in for a living, the bills, the schedules... the hustle and bustle. The older I get, the more I want to get in touch with the things that are important to me and make me feel like I'm living. I want to get away from the city and closer to my roots. Is it an early mid-life crisis or is it something more meaningful? Who knows. Right now I'm just taking it day by day and trying to move in that general direction. "Even if I don't get what I want, I'll still be out in nature breathing, feeling, and living. That's why I shoot."